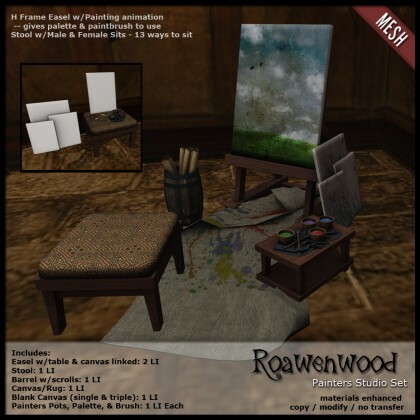 This month for We <3 RP I worked on an artists set. For painters specifically. I have visions of having different artsy or creative elements to offer in my place, and one that I used to have but retired was a painters easel set. Long time ago, and I wanted to do one but something different than what I had. I looked around a bit, mulled it over, googled looking at frames or easels and did an H-Frame type. I liked the idea of having a bigger canvas to work on and to have displayed somewhere. The set comes with quite a bit and is extremely prim friendly I think. No piece is more than 2 prims! The easel itself has a painting animation in it, embedded so no poseballs and it gives you the palette you need along with a brush. There is a stool included that is done in the same wood tones, and has a rather warm woven fabric for the cushion. 13 ways to sit for male and female avatars. It looks so comfy…. a place to gather your thoughts, admire your work or take a few moments. The set also has some lovely little clutter objects. Blank canvas in two styles, painters pots, brush, palette, barrel with scrolls, and a paint splattered canvas to throw around on the floor. I like how it turned out quite a bit. I still like the idea of having various artsy things around, I really do. No surprise considering what I do. This month at We <3 RP!! 30% discount for the month for the entire set, that means it’s something like 315L. Catch a ride! Take a Taxi to the We <3 RP Event! Posted in: Furniture, Role-Play, We <3 RP!